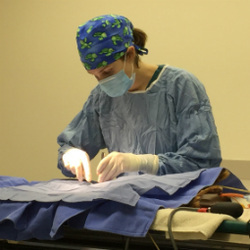 Surgical procedures are performed in a designated suite that meets all of the AAHA practice standards for surgery. Client communication is our priority, so you talk directly to the doctor about your pet's procedure and recovery instructions. We'll call you the minute your pet wakes up to put your mind at ease.